Marriage* 10 May 1907 Spouse: Laurance Kimberly Cronin. VIC, Australia, #M4293. [S35] Probate Records, PROV (Public Records Office Victoria), VPRS 28/P6, unit 321; VPRS 7591/P4, unit 336. [S5] Registry of Births Deaths and Marriages Death Index Victoria 1921-1985 "#D1601 (Age 87) [par Arthur MANTON & Emily SHORTER]." PALE orchid mauve set off by deeper mauve fuchsias, and pansies was chosen by Miss Kathleen Gladys Cronin, eldest daughter of Mr and Mrs Laurence Kimberly Cronin, of "Struan," Hillside Parade, South Camberwell, for her bridesmaids' frocks, when she married Mr Eric Crellin Kermode, eldest son of the late Mr Eric Kermode, and of Mrs Kermode, of "Zelk,' Douglas Street, East Malvern, and late of Tasmania. The wedding took place on April 13 at the Melbourne Grammar School Chapel, and was celebrated by the Rev. P. St. T. Wilson. The bride's frock was fashioned of parchment satin, which moulded the figure and flared out into a long train. Her veil of soft parchment tulle was caught to her head with a halo of orange blossom. The bridesmaids were the Misses Audrey Cronin, Peggy Cronin, and Elsie Manton, and the five-year-old trainbearer was little Ruth Cronin. Their orchid tulle frocks were extremely full below the knees and graduated into small trains. Their flowers matched the velvet sashes of their frocks. Black opal brooches were worn by the elder bridesmaids, while both Peggy and Ruth Cronin wore wristlet watches—the gifts of the bridegroom. The best man was Mr Lewis Kermode and Mr Tom Raynes Dickson acted as groomsman. [S35] Probate Records, PROV (Public Records Office Victoria), VPRS 28/P25, unit 304. [S14] Newspaper - Table Talk, 6 Oct 1932, p35. [S14] Newspaper - Table Talk, 10 May 1934, p53. Service 12 Aug 1964 - remains collected. Owned a property in Armstrong Road, which was named after them. Death-Notice* 17 Oct 1946 Mr Edmund La Touche Armstrong died at his home, Leven, Bates st, East Malvern, on Tuesday after a short illness. He was from 1896 to 1925 chief librarian and secretary of the Public Library, Museums, and National Gallery of Victoria. The late Mr Armstrong was born at Herne Hill, Geelong, in 1864, and was the fourth son of the late Mr John Simpson Armstrong, of the Irish and Victorian Bars, and a former Crown prosecutor in Victoria, and the late Mrs Alice Armstrong. Before the present Public Library was built the late Mr Armstrong, at the request of the trustees, went abroad to investigate modera public libraries in Europe and USA. The Melbourne Public Library, which was erected soon after his return, incorporates many features for which he was mainly responsible. He was the oldest member of the Wallaby Club, and was also a member of the Yorick Club, the Metropolitan Golf Club, and the Royal Empire Society. He was unmarried. ARMSTRONG, EDMUND LA TOUCHE (1864-1946), librarian, was born on 12 August 1864 at Herne Hill, Geelong, Victoria, fourth son of John Simpson Armstrong (d.1884), barrister, crown prosecutor and acting judge of the County Court, and his wife Alice, née O'Dell. His parents had migrated to Victoria from Ireland in 1858. 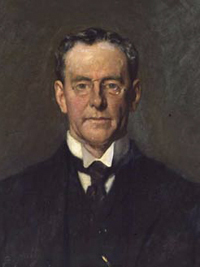 Sixth of ten children, Edmund was educated at Scotch College, Melbourne, and studied part time at the University of Melbourne (LL.B., 1893; M.A., 1899). [S185] Property Titles. ; PROV (Public Records Office Victoria), C/T 1837-228 dated 9 Feb 1926 - sold to Edmund La Touche Armstrong Gentleman and Edgar James Armstrong Bank Manager both of "Leven" Bates Street Malvern - joint proprietors. [S185] Property Titles. ; PROV (Public Records Office Victoria), C/T 1837-228 dated 22 Jan 1943 - Alan Campbell PENTLAND of 239 Tooranga Road Hawthorn Gentleman. Alan Campbell PENTLAND had a son with the same name, but it seems unlikely that he would have bought the property over a year prior to his marriage. [S11] Newspaper - Argus 17 Oct 1946, p3. Select Bibliography: ‘The State Library building’, La Trobe Library Journal, Oct 1970; Church of England Messenger (Victoria), 4 Apr 1930, 1 Feb 1935; Argus (Melbourne), 27 Mar 1925, 24, 26 Mar 1930, 15 Feb 1935, 17 Oct 1946; Wangaratta Chronicle, 2 Apr 1930; E. La T. Armstrong, Fifty Years of the P.L.V. : Some Recollections and Some Notes (State Library of Victoria); E. M. Miller, Some Public Library Memories 1900-1913 (State Library of Victoria); L. Scott, Mainly from Memory 1908-1926 (State Library of Victoria); Public Library, Museums and National Gallery of Victoria, Minutes 26 Mar 1925 (State Library of Victoria); newscuttings on loan from J. H. B. Armstrong (State Library of Victoria). Print Publication Details: David McVilly, 'Armstrong, Edmund la Touche (1864 - 1946)', Australian Dictionary of Biography, Volume 7, Melbourne University Press, 1979, pp 95-96. Marriage* 1855 Spouse: Alice Odell. Ireland. [S22] Victorian Government. BDM Index Victoria (online) "Spouse ODELL Alice." [S11] Newspaper - Argus 18 Aug 1884, p1. [S35] Probate Records, PROV (Public Records Office Victoria), 28/180 Prosecutor For The Queen. also buried 04-Jul-1886 Burial CROWTHER, ARTHUR NOEL. [S11] Newspaper - Argus 18 Aug 1884, p5. Marriage* 1855 Spouse: John Simpson Armstrong. Ireland. [S11] Newspaper - Argus 10 Sep 1915, p1. [S5] Registry of Births Deaths and Marriages Death Index Victoria 1921-1985 "#D3227 (Age 82)." [S11] Newspaper - Argus 22 Mar 1950, p11. [S35] Probate Records, PROV (Public Records Office Victoria), VPRS 28/P3, unit 1979; VPRS 7591/P2, unit 800; VPRS 28/P3, unit 3081. [S5] Registry of Births Deaths and Marriages Death Index Victoria 1921-1985 "#D16019 (Age 70)." [S3] Registry of Births Deaths and Marriages Edwardian Index Victoria 1902-1913 "#M2335." [S11] Newspaper - Argus 10 May 1902, p9. [S66] Berwick Shire Rates, 1870-1965 listed in 1920/21 rate book as owner of GEM-D-68.68A.68B.69.70 72a NAV 16. [S11] Newspaper - Argus 17 Nov 1928, p13. [S185] Property Titles. ; PROV (Public Records Office Victoria), C/T 1949-704 + 1989-626 - Henry Edward Beamish Armstrong died on 16th November 1928. Probate of his will has been granted to Louisa Flora Armstrong of Powlett Street East Melbourne Widow, Frederick Valentine Lewis of 430 Little Collings Street Melbourne Accountant and Frank Pilkington Brett of 120 William Street Melbourne Solicitor. [S185] Property Titles. ; PROV (Public Records Office Victoria), C/T 1949-704 + 1989-626 - Louisa Flora Armstrong and Frederick Valentine Lewis the survivors of the proprietors named herein are by direction of the Commissioner of Titles now registered as joint proprietors of the land now comprisedof 430 Little Collings Street Melbourne Accountant and Frank Pilkington Brett of 120 William Street Melbourne Solicitor. [S16] Newspaper - The Age 14 Nov 1913, p15. [S3] Registry of Births Deaths and Marriages Edwardian Index Victoria 1902-1913 "birth place in marriage entry." [S66] Berwick Shire Rates, 1870-1965 1937/38 rates G E YONGE 33 .. Ave Kew. D-69 C/T 1989-626 - George Ernest Yonge of 33 Adeney Avenue Kew Engineer. [S5] Registry of Births Deaths and Marriages Death Index Victoria 1921-1985 "#D2933 (Age 85) [par Richard LEWIS & Louisa BEW]." [S11] Newspaper - Argus 23 Mar 1955, p16.